Multichannel analogue audio outputs are sometimes absent from Blu-ray players (as indeed are the corresponding inputs of amplifiers and receivers), with manufacturers assuming you're using HDMI throughout. But what if the AV powerhouse at the heart of your system lacks HDMI? You could consider Octava's HDSA71, a useful gizmo which will decode multichannel tracks (up to 7.1) and present them in analogue form to a series of phono connectors. It also acts as a 4-in/2-out HDMI switcher. This unit staves off obsolescence – who said AV enthusiasts couldn't be 'green'? Within the confines of the compatible signal formats, the HDSA71 sounded pretty credit-worthy when it was fed into the multichannel input of our AV 'guinea-pig'. An 'auxiliary' 7.1 input, which takes the form of a second bank of phono sockets, ensures that the musically inclined can continue to enjoy DVD-As and/or SACDs. The HDSA71 can be operated with a handy remote handset, or via RS232. System integrators will appreciate the latter. SmartScan technology automatically-identifies active HDMI inputs. 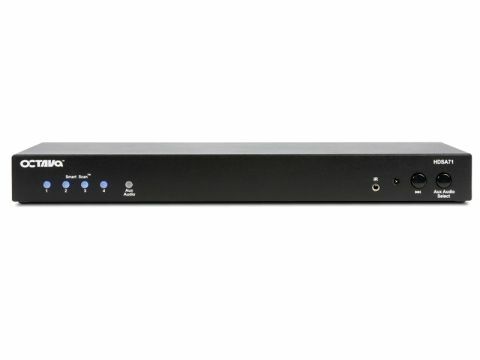 The cost of this unit, plus whatever you get from selling your existing amp/receiver, could buy a new unit that builds in the HDMI switcher – and gives you high-res audio decoding too. 16bit 44.1/48kHz uncompressed PCM is the only format handled by the HDSA71 – it has no truck with 'regular' flavours of Dolby Digital or DTS, never mind their high-res successors. You'll need to configure the HDMI audio options of your Blu-ray player accordingly.